The office of the Principal Account General (A & E) Kerala has issued the notification regarding the annual accountant statement of GPF for 2013 -14. According to the updated notice, uploading the Annual Account Statements (Credit Cards) for the year 2013-14 of GPF subscribers of Kerala on Departmental basis has commenced and will be completed by 23rd June 2014. The Accountant General (A&E) has further stated not to flood the email with individual requests for copies of the Statement as it is not possible considering it due to vast number of GPF subscribers. The Accountant General (A&E) maintains the individual GPF accounts of over 3.7 lakh employees of the Kerala State Government, High Court Judges and All India Service Officials working in Kerala. The General Provident Fund (GPF) annual accounts statements and credit cards for the year 2013-14 of Government employees will be hosted on Accountant General's website. To know the (GPF) annual accounts statements, one has to login to GPF Kerala account, select the GPF account number and enter the PIN number. If you are new to site, a default PIN generated through the system would be given to the user. The subscribers are requested to change the default Personal Identification Number (PIN) with a PIN/Password of their choice. As the facility to change the PIN may be misused by the other person, it should be kept confidential. To prevent the misuse of the account, the PIN should not be disclosed to others. If any subscriber changes his/her PIN on the portal, it is advised to change the PIN on IVRS also. In case the subscriber forgets the password, the office could easily make the changed secret code available to them. The GPF for full time employees is constituted in 1964 while the GPF for Part-time contingent employees came into effect from 2005. The admission to the Provident Fund Scheme started in November 2007. 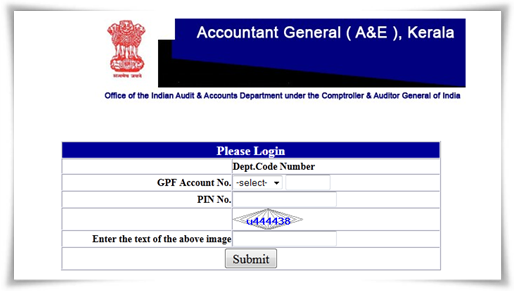 The GPF annual accounts statements can be accessed through the official website of Accountant General (A&E) Kerala.